Ask any professional gardener or gardening enthusiast and they will tell you just how important it is to prune plants/hedges/trees. If you’re not sure what all the fuss is about, then read on to find out what exactly is pruning, why it’s important and tips on how to perfect your pruning skills. What is Pruning? And Why Is It So Important? Let’s start by answering the basic questions that most novices ask. What is pruning and why should I do it? Well, in simple terms, pruning is the trimming and cutting of plants/trees/hedges. Contrary to popular opinion, pruning is not done as just a cosmetic procedure. While it’s true that regular pruning helps to shape the plants and trees, allowing you to train them to grow in a specific manner, there’s more to pruning than just aesthetics. Apart from making your plants look well-maintained, pruning also encourages better growth and flowering. By getting rid of the diseased, dead or otherwise damaged parts of a plant, you’re allowing the plant to use all its energy into growing into a healthy plant. It’s a well-known fact that following a pruning session, the plant will have a growth spurt. Pruning helps the plants to stay healthy, have better growth and in turn, give you more flowers and fruits. A general rule of thumb is to prune during late winter to early spring. This is when the plants are dormant and pruning around this time will help get them ready before growth begins. But not all plants should be pruned in winter. Depending on the growth cycle and the plant’s capacity to grow, some plants can be pruned in spring and even summer. Pruning at the wrong time of the year certainly won’t kill your plants, but it can lead to slower growth and weaker plants. When pruning plants and trees, one of the most important things to keep in mind is to make clean cuts. This will ensure that the plant/tree heals faster and looks neat. Jagged ends can take longer to close, forcing the plant or tree to waste its energy in healing the cut instead of concentrating on growth. To avoid this, use sharp gardening tools. Shearers, Saw, and hand pruners are some very popular pruning tools that are used. The fastest way to kill a plant is to allow the spread of disease. When a branch or a specific part of a plant gets diseased, immediately pruning off that part to prevent the spread of disease is crucial. To ensure that you spot any disease before they have a chance to spread, you need to regularly monitor your plants. You can’t just prune them during winter/spring and forget about them. Close inspection of plants will help in spotting any trouble and nipping it in the bud (pun intended). Once disease spreads, plants will rot at a very quick pace. Disease can also spread from one plant to another, affecting all the plants in your garden. So, being proactive is the only way to avoid such disasters. Pruning hedges are slightly different from pruning plants or trees. To get started, when planting hedges, it’s a good idea to dig a trench instead of digging individual holes for each hedge. You can then fertilise the soil uniformly and plant the hedges in a perfect row. Doing this will ensure uniform growth, which will make shaping and garden maintenance a lot easier. For a perfect straight top, use a string line as guidance. Simply eyeballing it can leave you with slanting tops and ruin the look of your hedges. Regular trimming encourages bushy growth, so be sure to do that. Make sure the tools you use are super sharp. Blunt tools can damage the plant, making them more susceptible to disease. Use cardboard templates to shape your hedges. For instance, if you want your hedge to have an arch at the top, you can use a cardboard template to guide you with getting the shape right. This is just common sense. It is easier to train a young tree than one that is mature. When you start on the younger plants, you can manipulate their growth and shape according to your preference with minimal work. Pruning a full-grown tree can be a difficult job requiring professional expertise. Also, when not trimmed, trees can become quite dangerous, with branches falling on the roof or otherwise damaging the house. So, with pruning, an early start is the way to go. As mentioned earlier, selective pruning can be done to control the spread of disease or get rid of insect infestation. Anything that threatens the health of a plant or tree is immediately gotten rid of. When disease occurs, a gardener goes into damage control mode, doing his/her best to minimise the adverse effects. Pruning can also be done to control the height of a plant, tree or hedge. You will have an idea of how tall you want the hedges to be, or want to ensure that a tree does not grow too tall or spread out too much, interfering with any utility lines that are running through. In such instances, pruning can come in handy to keep things under control. 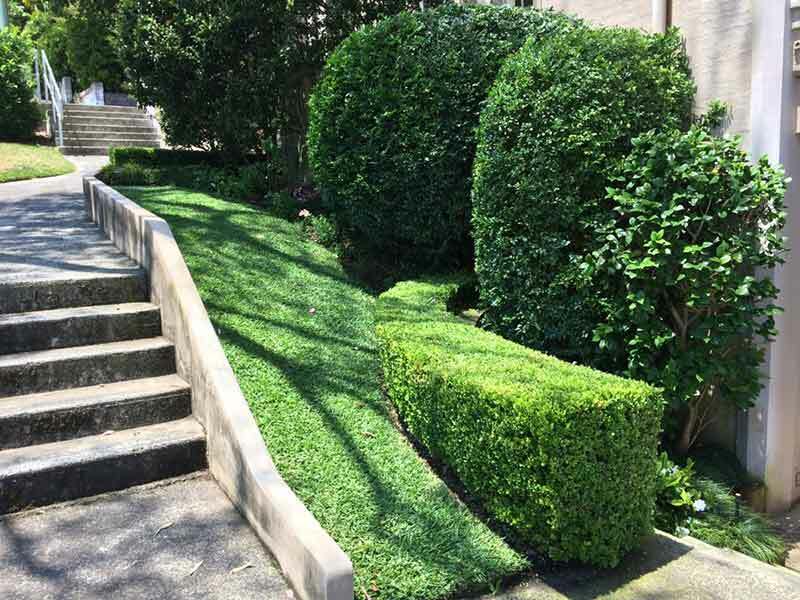 Thinning is a popular practice for hedges and landscaping design. Thinning is the process of reducing the density at the top branches. It is done to facilitate better sunlight penetration and air circulation. Without thinning, the branches underneath will not receive enough sunlight, which will affect the overall growth of the hedge.